Phillip Hudok claims the state of West Virginia is violating his religious beliefs by requiring him to get a biometric drivers license. 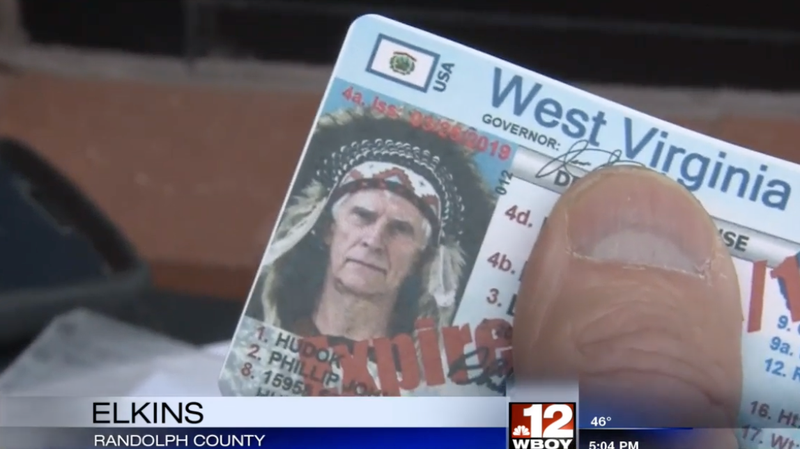 The Christian West Virginia man garnered local attention on Monday afternoon when he arrived at the Elkins Department of Motor Vehicles wearing Native American attire, reports local NBC/ABC affiliate WBOY. In 2008, West Virginia DMV Commissioner Joseph Cicchirillo allowed Hudok and a group of 50 or 60 Christians to get a new drivers license and not have their photo stored on a database, according to the Associated Press. For the next several years, Hudok was able to use a license with a face photo that was not stored on a database. But Governor Earl Ray Tomblin blocked the exemption and Hudok had to get a license with a photo that was stored on May 2017, according to WBOY. Hudok reportedly proceeded to show up to the DMV wearing a Native American costume. And he wore such an outfit again when he showed up this week to renew his license. In an interview with WBOY, Hudok suggested that other religious groups were protected more than Christians—an apparent explanation for his racist costume. It seems Hudok isn’t referencing any religion specifically, but dressing as a Native American caricature for shock value. In February 2012, Hudok reportedly spoke to the Senate Transportation and Infrastructure Committee in support of a bill that would allow exemption from Real ID for religious reasons. According to The Register-Herald, Hudok equated Real ID to the Biblical “mark of the beast” from the Book of Revelation. “If we as Christians comply with the Real ID act, we would be enrolled into a global system of identification that directly links our body through biometrics to our ability to buy or sell,” Hudok reportedly told the committee. Apparently in the ensuing years, he has found that one alternative is to follow the law but wear an offensive costume while doing so. Update March 27 9 am EST: Hudok responded to Gizmodo’s request for comment on Wednesday morning. “Biometrics is numbering man,” he said, suggesting that the Biblical prophesy that a “Mark will someday be required by all,” was about biometrics. He said “cross dressers and women wearing burkas” get special treatment at the DMV and compared his protest to the Boston Tea Party. “World is and has always been a spiritual battleground, not a playground,” Hudok added.